CST Inc, will launch a new test adapter , the Eureka2-DDR3 1333Mhz DIMM Memory Tester for testing the 240pin DIMM Memory. CST Inc will be demonstrating the new Eureka2 DDR3 DIMM system at the Computex Show in Taiwan schedule on June 2 - 6th , 2009. CST is pleased to introduce the 4th Generation bench top memory test system, the Eureka2, specifically designed for high volume memory manufacturers, large memory distributors, PC & Servers computer manufacturers and engineering laboratories. The Eureka2 Test System is a DDR3 Module tester capable of testing DDR3 Chips, DIMM & SODIMM memory, and it utilizes CST‘s proprietary test algoritium to capture all known memory failures. 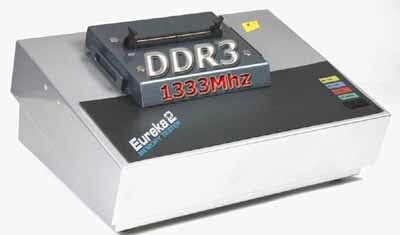 The Eureka2 Memory Test system with CST's Proprietary Technology offers a significant advanced programmable features, wide Vdd voltage range setting and high frequency testing up to 1333Mhz data rate. The “Eureka2 DDR3 240pin DIMM Adapter” is built to work with the CST Eureka2 base tester, which allows user to swap inter-changeable , DDR3, DDR2 and DDR Test adapter. With a simple push-button and a mouse click, the Eureka2-DDR3 tester quickly auto-identify and displays the memory size, clock frequency, and speed of the memory chip. The new “Eureka2 DDR3 DIMM ” tester provides added troubleshooting capability for the present and future DDR3 memories at affordable prices. It is targeted for the manufacturers, computer integrators, memory distributors, and service depots. It is indeed the fastest tester and the easiest to use in its class. An advanced PC software is required for interfacing with a PC via the USB port. The Eureka2-DDR3 tester can also be interfaced to CST 's RoboFlex1 ,RoboFlex2 Automatic DIMM Handler and the New RoboFlex3 Pick and Place Automatic Handler for mass volume production testing.